If you have an hour and a stove and enjoy delicious things then I have a weekend kitchen project just for you! Homemade ricotta! Making cheese is “whey” easier than it seems. Cheese-making has been on my to-do list for “whey” too long. (Are we tired of this joke, yet?) (No “whey”!) I promised myself I would give it a go after my trip to Vermont this fall when I got to go behind the scenes at the holy grail of cheese-making BUT then life happened and there was always a-something-else that required my time. So the other day I got serious. I gave myself a pep talk, carved out one hour, and began my first foray into cheese-making. 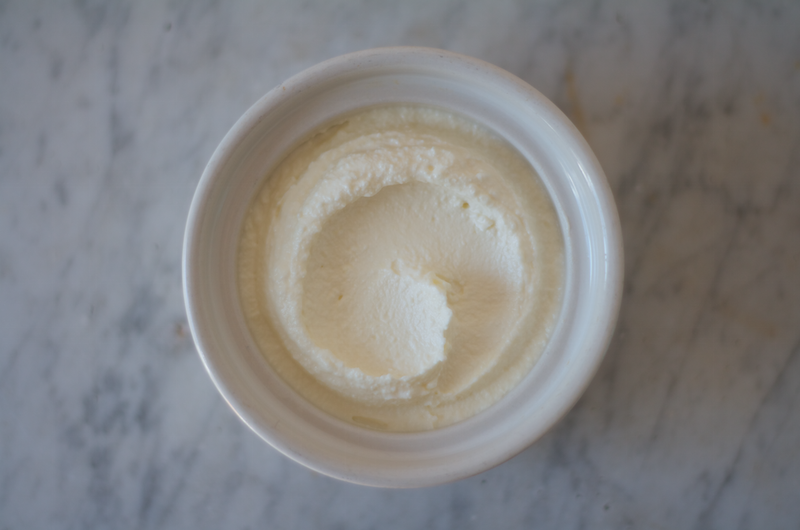 Homemade ricotta is like a gateway cheese. One you start with the ricotta the doors open to the hard stuff. You realize what were you ever waiting for because that was just so ridonkously easy. Now I just can’t stop thinking about all the other cheeses out there that can come out of my tiny kitchen. Ricotta. Burrata. Don’t even get me start-ta[ed]. Ricotta is the most simple of DIY cheeses so we’re going to start there. 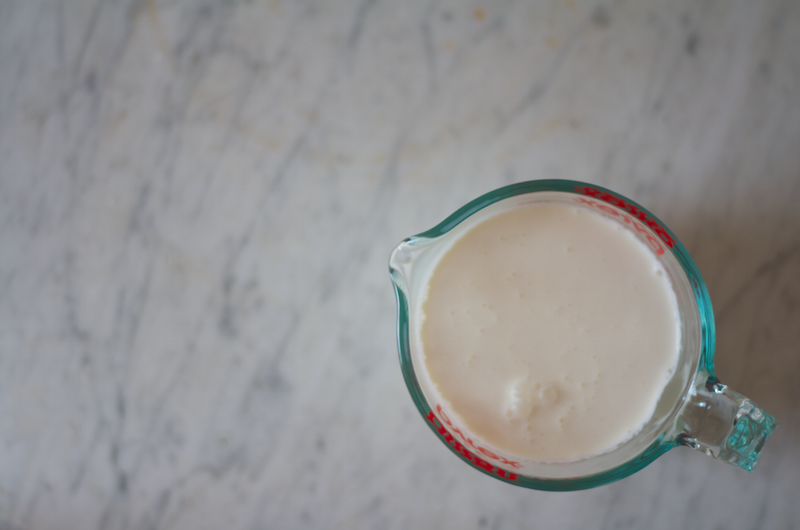 All you need is lemon juice, whole milk and cream. 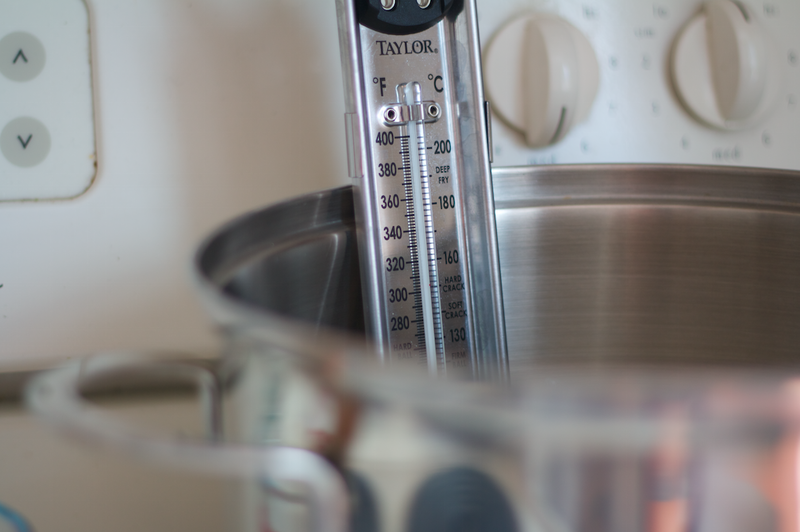 The most involved tool that is required is a kitchen thermometer (but you already have in your arsenal from beer caramel-making, right?). After you collect your tools, it’s time to get started. 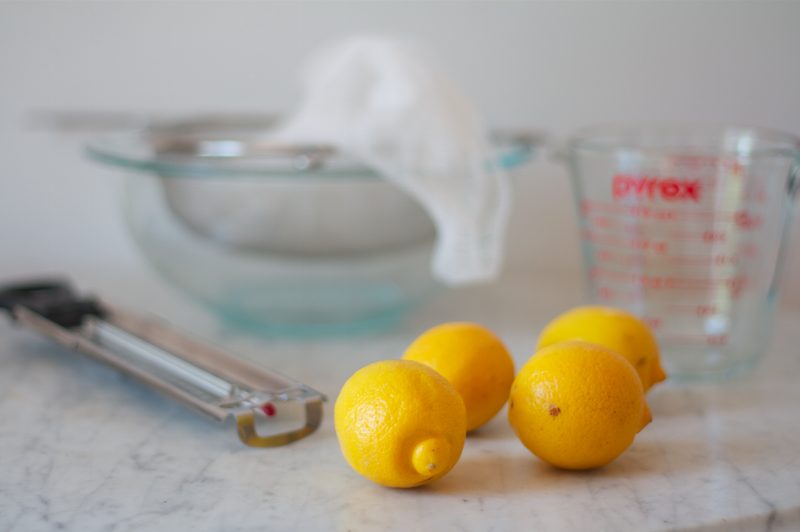 Begin by simmering the cream, milk, and lemon juice together until the mixture reaches 190°F and curds begin to form. You are halfway there! Wasn’t that so easy? This is the point in the process when I started asking myself the question: Why did you wait so long to try making ricotta? It is the perfect dinner party snack and is about 400 times better when it is lovingly crafted from scratch. After the mixture reaches 190°F and curds are forming left and right, remove the pan from the heat, and let is sit for 10 minutes. This is when the curds are releasing whey and you have to let them do their thing and be patient. While you wait, get ready for the next step. 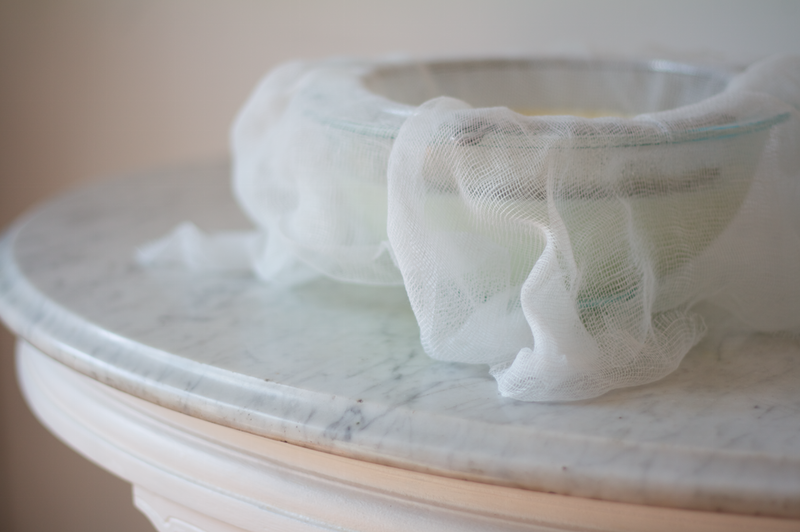 Line a fine mesh strainer with cheesecloth and set it over a big bowl. My biggest bowl was actually not big enough for all the liquid that strained through so I had to switch out the once which is not that annoying of a step but if you have a ginormous bowl, then I would recommend using it here. After all the liquid has drained, gather the ends of the cloth together, and give it a good squeeze. Gently stir in the salt and transfer to a container for storage. Just like that you made cheese! Now go pour yourself a glass of wine and have a homemade cheese party. In a large pot gently stir together milk, cream, and lemon juice and set over medium heat. Stir every few minutes to prevent a skin from forming on the top of the surface and check that there is no burning on the bottom of the pan (turn down the heat if this begins to happen). Check the temperature when you start to see steam rising from the pot. Curds will begin to form rapidly as the temperature gets close to 190°F. Stay close to the pot at this point and when the temperature reaches 190°F turn off the heat and remove the pot from the burner. Let the pot sit undisturbed for 10 minutes to give the curds a chance to release more whey. 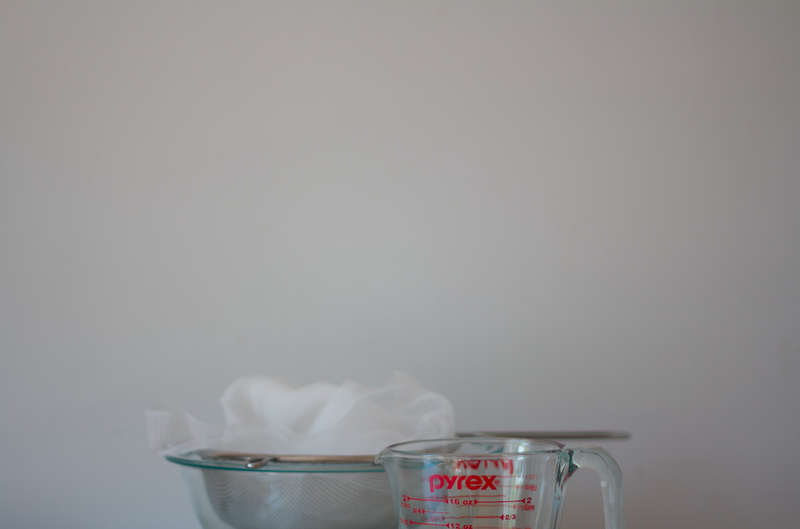 While you wait, line a fine-mesh strainer with cheesecloth and set over your largest bowl. Pour the curds through the cloth and let the whey drain for about 10 minutes. 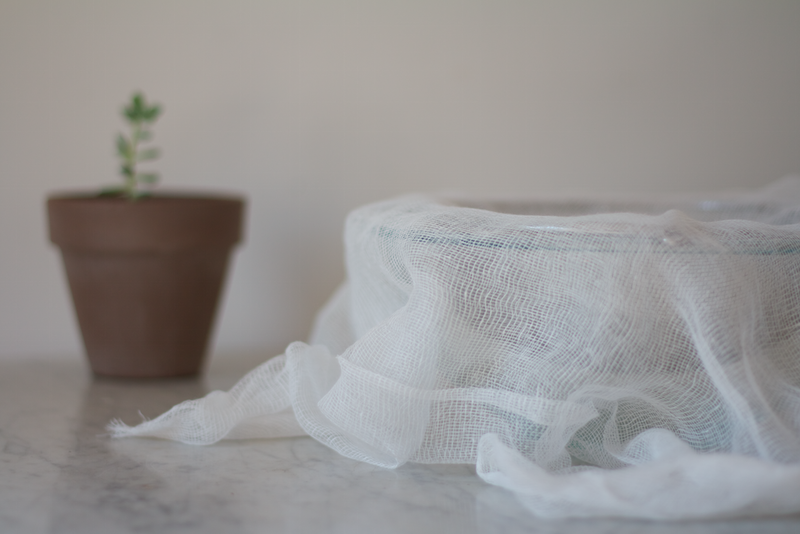 Gather the cloth into a bundle and give it a gentle squeeze to strain out the last little bit of liquid. Unwrap the cheese and gently stir in the salt. Transfer to a small bowl and chill in the refrigerator then serve. Want more “whey” cool cheese-making ideas? Stop by The Culinary Life tomorrow for another One-Hour cheese recipe. 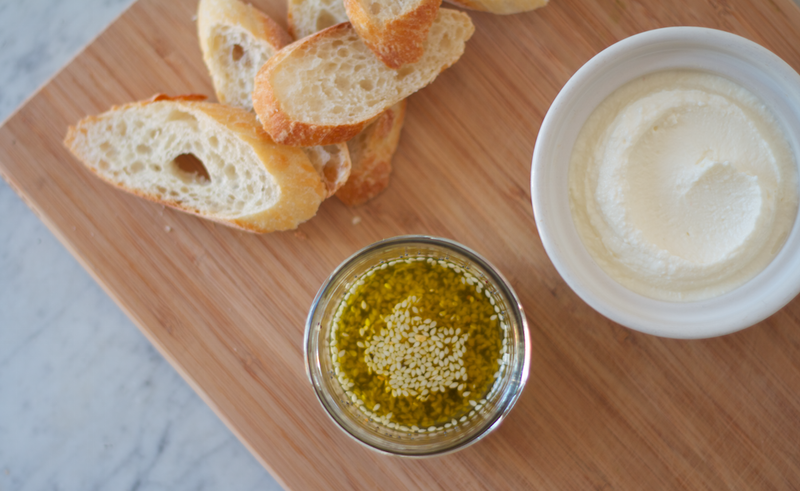 And here is a little sneak peek – which I will be sharing soon – of how I topped my ricotta snacks!! Dang that looks hella good! And it looks like something I can do! Why have I never made my own ricotta before? This sounds just amazing, and super easy. Yay! Wow, never knew how simple it was to make ricotta. Looks great! Excuse me, is the cream one cup or two? it says one cup but then one pint, which is two cups. Please clarify. Thanks. Thanks so much for the catch! I’ve made the change – the recipe should read 2 cups. Great blog! I just had to buy some ricotta for a spinach pie ring that came out delightful and will make again. Also, great for appetizers and snacks. I love all your recipes! This looks delicious! What a fun weekend project! 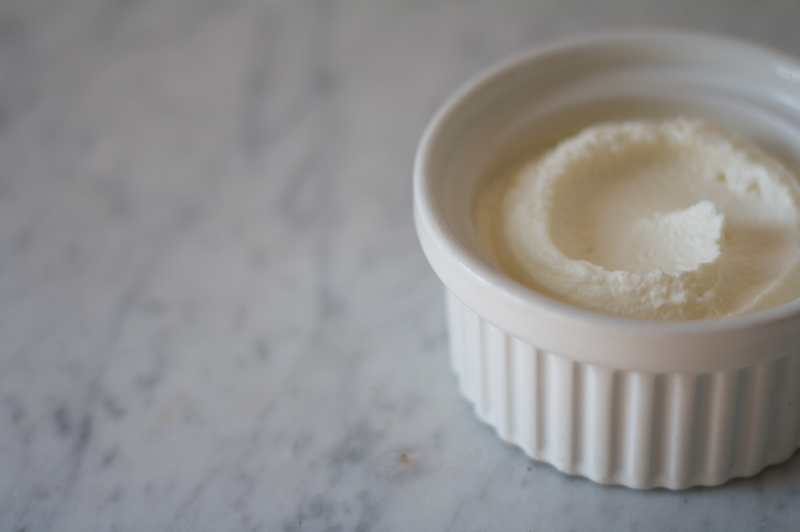 I love making my own yogurt but it never occurred me to make homemade ricotta and it look so easy. Can wait to try this! Yes, it is so easy and a great kitchen project! I just tried this and it didn’t curdle. I even reheated and added some white vinegar, but nothing. I’m not using ultra pasturized milk. I’m sad!